On route N8, between Marseilles (45km.) and Toulon (10km.). 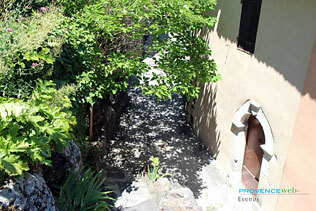 Perched oddly on steep inclines, Evenos is a group of old houses that overlook the ruins of a castle. The main street of the village ends up at the foot of the dungeon. 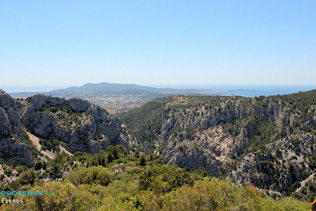 The Chemin de la Ronde is a way that goes from La Ciotat to Toulon, and for those that dare to look, there is the deep crevice ot the Gorges d'Ollioules. Many tourists visit this unique site. As you go up to the old village you will find the well known climbing site called the Falaises du Cimay, where 20 years ago rnarble was still being extracted. 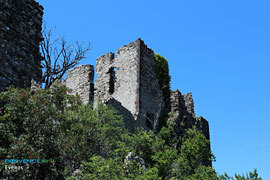 built of rock around an 11th c. feudal castle. 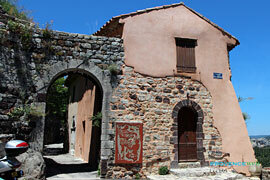 a pretty little hamlet dominated by Mont Caume, the highest mountain of the Toulon region(801m.). This is the most recent of the hamlets, around which modern life is developing the fastest. However Ste. Anne is not without charm. Leaving the canyons, you will discover Les Grès de Ste. Anne formed of calcareous knolls and deep pits sculpted by time. St. Martin Church. Les Grès de Ste. Anne. The ancient sand pits. Excursions in the Gorges du Cimail, the source of la Foux, Gorges du Destel. Le Beausset (4 km), Ollioules (4 km), Sanary (10 km), Bandol (12 km).